Clockwise from left: Lovell Rodgers, John Marino, Patricia Mccue, Donna Marino, Darren Donald and Kinchasa Donald. Six individuals are facing felony charges after they allegedly used fake business to fraudulently obtain grant funds from the Pennsylvania Department of Community and Economic Development, the Attorney General's Office announced this week. 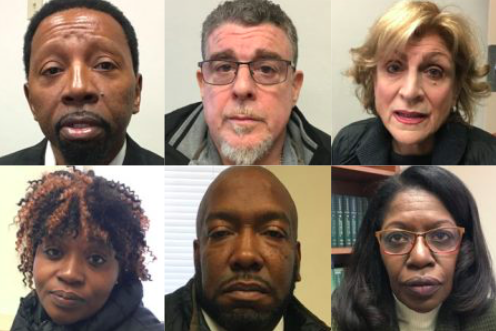 Prosecutors said the six defendants submitted phony invoices to the department's Guaranteed Free Training Free Training program, which aims to stimulate growth and provide new job opportunities to businesses across Pennsylvania. The invoices, submitted between December 2012 and February 2016, totaled $336,023 in reimbursements, according to investigators. Another four invoices for $59,426 were denied after grant program administrators became suspicious of the claims in the spring of 2016. Counterfeit invoices were allegedly submitted for five fake vendors who said they were seeking funds for employee training. The five companies — YKT Corp, Pocono Developers, R 1 Incorporated, Top Don Tools and Tamray Technologies — were all registered with the Pennsylvania Department of State but none of them had any employees or conducted any type of business, prosecutors said. YKT Corp and Pocono Developers, for example, allegedly claimed they had 138 employees receiving job training. Records from the Department of Labor and Industry later revealed that neither company had any employees. Investigators used IP address tracking to identify the John Marino, 56, of Stroudsburg, as the alleged ringleader of the conspiracy. Communications from Marino's IP address were linked to both YKT Corp and Pocono Developers. The same computer was allegedly also found to have been used to apply for and receive grants for R 1 Incorporated, Top Don Tools and Tamray Technologies. A search warrant executed last July discovered that none of the five companies conducted any legitimate business activity. There were no tax records, personnel files or customer information for any of them. Investigators ultimately identified and charged six individuals who claimed to be executives or managers with the five bogus companies. The defendants are charged with dealing in proceeds of unlawful activity, corrupt organizations, criminal conspiracy, theft by deception, tampering with public records and other felony and misdemeanor offenses. John and Donna Marino, along with Donna's daughter, Kinchasa Donald, are also charged with welfare fraud after agents allegedly discovered they had been fraudulently receiving public assistance since at least April 2012. Bail for all six defendants was set at $50,000 unsecured ahead of a preliminary hearing on May 23.